As part of my year-long 50th birthday celebration, my friend Yen and I camped at San Miguel Island. You’ve probably never heard of the island, and it’s a hard place to get to. Indeed, only about 200 lucky people a year camp on the island. This post collects my thoughts about the experience. San Miguel Island is the westernmost of the 8 Channel Islands off the Southern California coast. It’s southwest of Santa Barbara and roughly south of Point Concepcion. It’s often covered in fog and relatively low-slung, so it’s often visible from Santa Barbara only on clear days. Island Packers has an exclusive concession for commercial boat rides to San Miguel Island. The boat leaves from Ventura Harbor and stops at Santa Rosa Island on the way. This stop adds about 45-60 minutes to offload/onboard Santa Rosa Island campers. Dock-to-beach travel time was about 5 hours out and 4.5 hours back. On the way out, we had some rolling seas which led to several folks getting seasick (I didn’t think it was too bad personally). 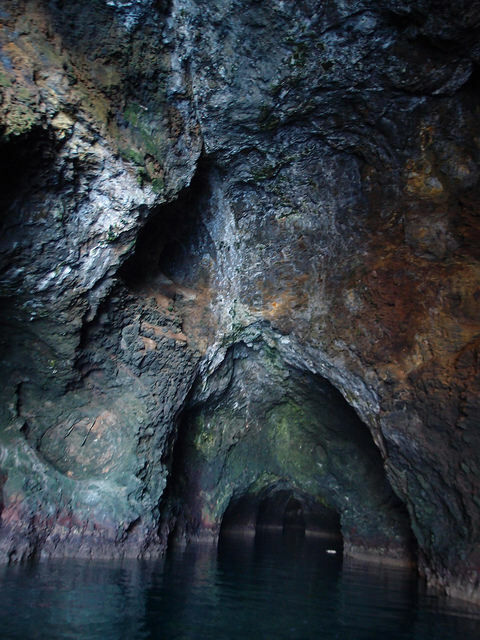 On the way back, Island Packers usually makes a short detour into the Painted Cave seacave on Santa Cruz Island (see photo at right). Odds are good of seeing some marine mammals on the way, plus the coastline views of Santa Cruz and Santa Rosa Islands are pretty. The round-trip boat ride to San Miguel Island cost about $250/person. Transferring from the boat to the beach requires skiffs. This means you’re likely to get a little wet. If the seas are too choppy in Cuyler Harbor, skiff landing isn’t possible at all. Island Packers schedules the trips to reduce this risk, but it can’t be eliminated. Channel Islands Aviation may fly charters to the San Miguel Island airstrip. (Their website has inconsistent information). Cost: $1,200+. The island has 2 “unrestricted” hikes: (1) along the Cuyler Harbor beaches for about a mile or so, and (2) up the canyon to the campground, Cabrillo Monument, the Lester Ranch ruins (not much to see), and the Ranger Station. It’s a steep but short hike of less than a mile. The remaining hikes require the presence of the ranger or a volunteer. The justification is that the island used to be a bombing range, and there’s unexploded ordnance still around. The ranger/volunteer is present on the island only some of the time, and the NPS says the island is closed to all visitors when they aren’t. So you really can’t visit or stay at the island whenever you want; you need to sync up your visit with the ranger/volunteer. All Island Packers weekend trips should satisfy this requirement, but visits at other times may not be allowed. the hike from the campground to Lester Point (3 miles each way). The hike navigates the cliffs overlooking Cuyler Harbor, with fantastic views of the harbor, the surrounding cliffs, and Prince Island; then through rolling grasslands; and then to Lester Point, with potentially fabulous views of Harris Point, Simonton Cove, and the island itself. On our May 2012 visit, Lester Point was fogged out, so we saw none of those. On our September 2018 visit, clear skies led to a truly spectacular view (see right). the hike from the campground to Cardwell Point (about 2.75 miles each way). The hike gradually descends rolling hills to Cardwell Point, which has several overlooks to see sea lions, elephant seals, and other seals. We saw hundreds of critters. The overlooks are quite close to the beaches, so the viewing is more intimate than at Point Bennett. the hike from the campground to Point Bennett (5+ miles each way). The hike goes up-and-down two peaks and over many rolling hills, with a detour to the Caliche Forest. The trail eventually turns at the western airstrip and follows a dirt road to the scientists’ residence. The trail then navigates down the palisade, with fabulous views of offshore islets, until it reaches a sandy bluff about a 1/4 mile away from the beaches. We stopped at the bluff. Because of the distance, we didn’t have as intimate a view of the marine mammals (including lots of sea lion babies!) as we did at Cardwell Point. Still, Point Bennett is truly gorgeous with blue and green water, wide beaches, rocky points and islets, and hundreds of marine mammals. I rank Point Bennett as one of the top 10 prettiest places in the United States. On our trip, we arrived at 1pm Saturday, hiked to Lester Point from 3-6 pm, hiked all day Sunday to Point Bennett, and then hiked to Cardwell Point on Monday morning before the 12:30 boat departure. 48 hours on the island was a perfect amount of time to do all three hikes. There are 9 campsites on the island. They all have a food locker, a picnic table, and a much-needed windbreak. There is one outhouse for the campground. (There is a second outhouse at the ranger station about 1/4 mile away, and a third outhouse at the scientists’ residence on the other side of the island). The campsites are all comparable, except for #5, the group site. It has two food lockers and tables and double the space. It also has the best view of all campsites–an unobstructed vista of Santa Rosa Island to the east and a pretty good northern vista of Prince Island, parts of Cuyler Harbor, and the Santa Barbara coastline. Water is a top consideration: you must bring 100% of the water you use for drinking, cooking, and cleaning. You might plan on 1 gallon/person/day. Each gallon weighs 8 pounds. So if you’re going for 3 days, you should bring 24 pounds of water. The hike from the beach to the campsite is short but steep, and carrying that much water in addition to my gear was more than I could handle. Several campers and I made a second run to carry the water rather than try to do it all in 1 trip. (Packing note: Island Packers wants you to store both the water and any fuel on the boat deck, not in your gear). Believe it or not, I did get 1-2 out of 5 bars on my cellphone from the beach and campground. But you’re on a remote and scenic island–put the phone away! Years of sheep ranching and naval bombing have taken their toll on the San Miguel Island ecosystem. Still, it’s one of the world’s beautiful places. There’s so much to enjoy: the island and ocean vistas; the azure and turquoise water; the marine mammals; the flora (including wildflowers and coreopsis), the birds, and the island fox (which I sadly didn’t get to see); the serenity and remoteness; the jaw-dropping stars at night (including the Milky Way); and if the fog doesn’t foil your plans, the sunrises and sunsets. While life gets hectic on the mainland, I let my mind wander back to the island and it calms me. That said, I’m not sure when I’ll go back. Other than the elusive island fox, I saw everything I wanted to see on the island. Sure, I’d love to see it all again, but I have other priorities too. I’ve now been to five of the 8 Channel Islands (Catalina, Anacapa, Santa Cruz, Santa Rosa, San Miguel). I’ll go to Santa Barbara Island when access is fully restored; and maybe I can find a way to get to San Clemente and San Nicolas Island. Personally, I don’t recommend San Miguel Island as the first Channel Island to visit. Catalina is the easiest island to get to, and the most visitor-friendly. 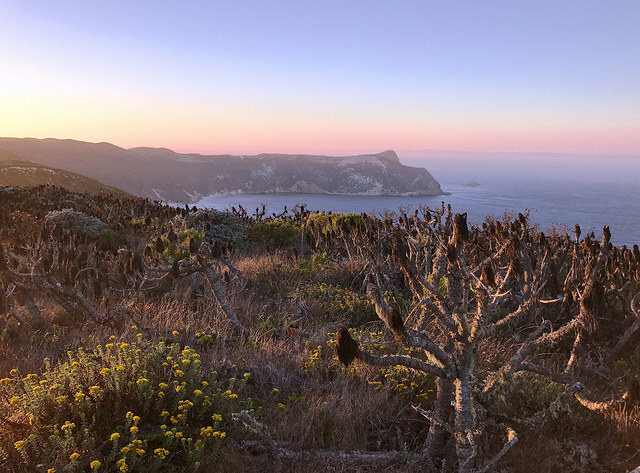 Anacapa Island is a great day trip, but the real magic happens at sunset and sunrise at Inspiration Point. Camping overnight there is sublime if you can ignore the foghorn. 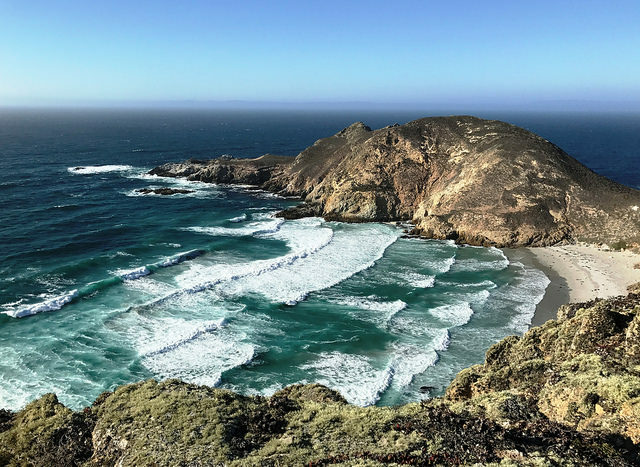 Santa Cruz Island is big enough to keep visitors busy for a while, and it’s more visitor-friendly than Santa Rosa or San Miguel–shorter and more frequent boat rides. and more services for campers. Whichever island it is, go if you get the chance. They are all amazing, and all of them are worth the effort!